It might be time to see if there is still any way to use those frequent flier miles that have been squirreled away for the last few years. Thanks to Karol, I’ve learned that the Deutsches Literaturarchiv Marbach (located in Marbach-am-Neckar), which recently acquired the archive of W.G. Sebald, has announced that an exhibition drawn from the archive will begin September 28, 2008. It will be accompanied by a catalog. Here is the announcement, taken from their website. Der Autor W.G. Sebald starb im Jahr 2001. Kaum ein deutschsprachiger Autor hat sich in der Literaturgeschichte der jüngsten Zeit so schnell seinen Platz erobert wie er. Er wird gelesen und, was sich nicht immer verträgt, erforscht. Worin liegt seine Faszination? Was verrät sein Marbacher Nachlass über ihn?Die Ausstellung, in deren Mittelpunkt Sebalds Hauptwerke von »Schwindel.Gefühle« bis »Austerlitz« stehen, führt beide Fragen zusammen. Die Qualität seiner Bücher wird deutlich durch die Eigenheiten seines Nachlasses, der durch den Prozess des Schreibens und Weiterschreibens, des Lesens konstituiert wird. Letztlich ist dieser Nachlass der Nachlass von Sebalds erfundenen Gestalten: Sie besitzen ein Vor- und Nachleben unabhängig von ihrem Autor, der nur ein Konzentrationspunkt, ein Kondensator, Transformator von vielen ist. Er zieht sich in sein Werk zurück, bringt sich zum Verschwinden, führt das Leben der Anderen. Es gibt keinen Unterschied zwischen realen und fiktiven Elementen. Das Wahre wird Traum, das Geträumte wahr. Die Realien des Vor- und Nachlebens der fiktiven Figuren werden über das Schreiben in das fertige Buch hineinverwoben und führen ein Leben nach dem Buch: Die Leser schreiben daran weiter. Only when I went to Switzerland in 1965, and a year later to England, did ideas of my native country begin to form from a distance in my head, and these ideas, in the thirty years and more that I have now lived abroad, have grown and multiplied… Only a guest in England, I still hover between feelings of familiarity and dislocation there too. Once I dreamed, and like Hebel I had my dream in Paris, that I was unmasked as a traitor to my country and a fraud. Not least because of my misgivings, my admission to the Academy is very welcome, and an unhoped-for form of justification. 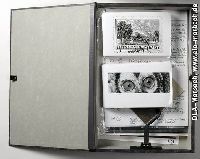 The archival box containing the typescript of Austerlitz beneath two photographs used in the book: the Theresienstadt stamp (page 240) and a close-up of an owl’s eyes (page 4). 1/ Sebald’s postcard archive (or at least part of it?!) housed in a wooden filing box (maybe 8 inches long) and opened to a postcard of a Norwegian village bearing the inscription “The Road to Hell” – “Hell” being the name of the village! No doubt appealed to Sebald’s morbid sense of humour! 2/ The second object was a Gallimard paperback of Claude Simon’s Les Jardin des Plantes (1997), inscribed by Sebald on the last page with a detailed chronology of Jacques Austerlitz’s life as he planned the writing of Austerlitz… obviously this book was a major influence then… The exhibition catalogue informs you that he based Austerlitz’s character partly on Simon’s character Gaston Novelli, an Italian painter who in his work uses the letter “A” over and over again “like a long-lasting scream”. (I’ve just got hold of a copy of this book incidentally – Northwestern University Press brought out a beautiful hardcover edition of it in 2001 – and it is an extremely interesting book – hard going at first – I’ve read the first 50 pp or so – but it really draws you in!) Also noteworthy in this regard is the crossings-out you can see on the page – Sebald was at pains to get the chronology right for Jacques and alters, for instance, when Austerlitz’s depressions start by a couple of years etc.